PopCultHQ recently viewed a performance of E.D.G.E. 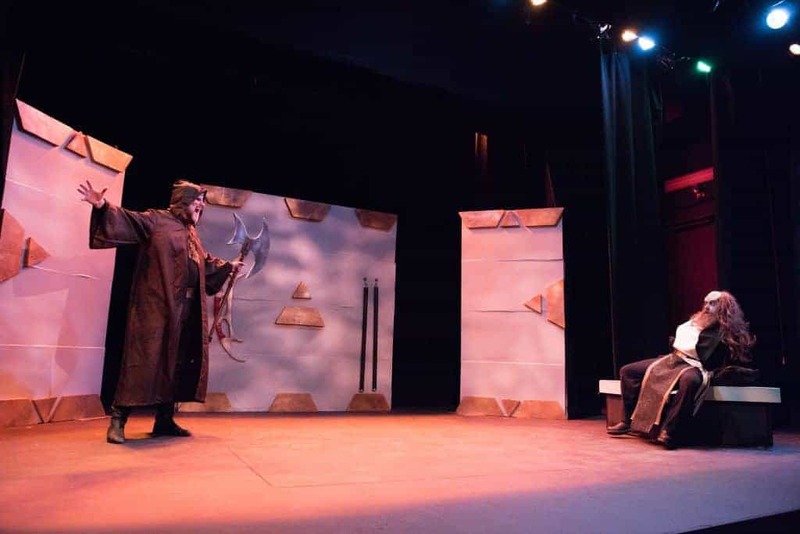 of Orion Theater’s staging of “A Klingon Christmas Carol“. Be sure to check out E.D.G.E. 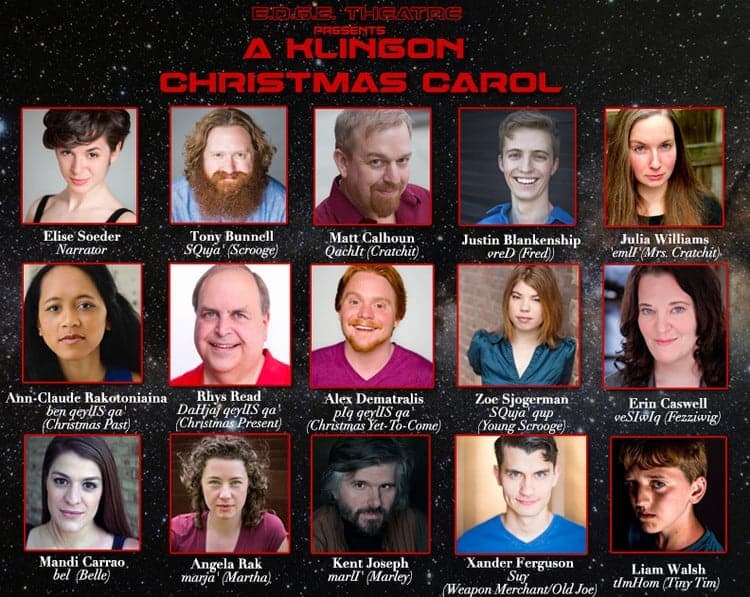 of Orion Theater’s website and catch a performance of “A Klingon Christmas Carol” before it closes on December 16th. 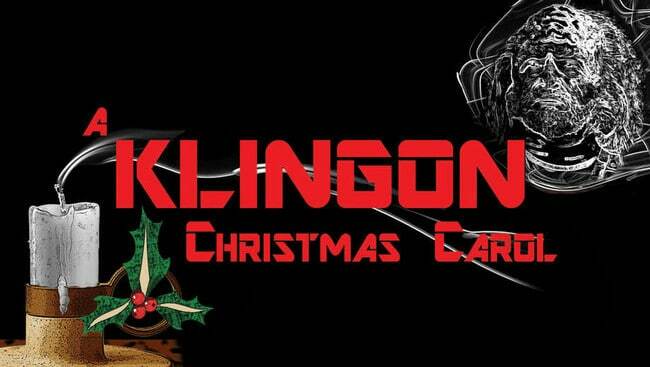 A Klingon Christmas Carol is the classic Dickens tale of Christmas, redemption and hope. It is the first play of its kind performed in Klingon, a language taken from the Star Trek franchise. The tale is both familiar and different, as names, settings, social customs and the like, are all changed to fit within the paradigm of Klingon culture. These sets, while seemingly simple, add a great deal of depth and volume once the play begins. Walls decorated with Klingon symbols and several of their weapons remain constant throughout the first and second acts. Several boxes of varying shape provide functionality for various scenes, as both tables, a bed and seats. The lighting for the play provides excellent mood, whether it is a fully lit stage to encapsulate the whole scene, or a dramatic moment of dimming lights that ends in a single spot, surrounded by total darkness. This adds so much to this amazing story. Instead of Victorian London, audiences are whisked across the galaxy to the Klingon home-world, during the Feast of the Long Night, a time of celebration and feasting that ends with combat games to challenge the honor and glory of different Klingon houses. Taking Charles Dickens story, and not only reconstructing the story to fit an entirely different fictional place and culture is an impressive undertaking. 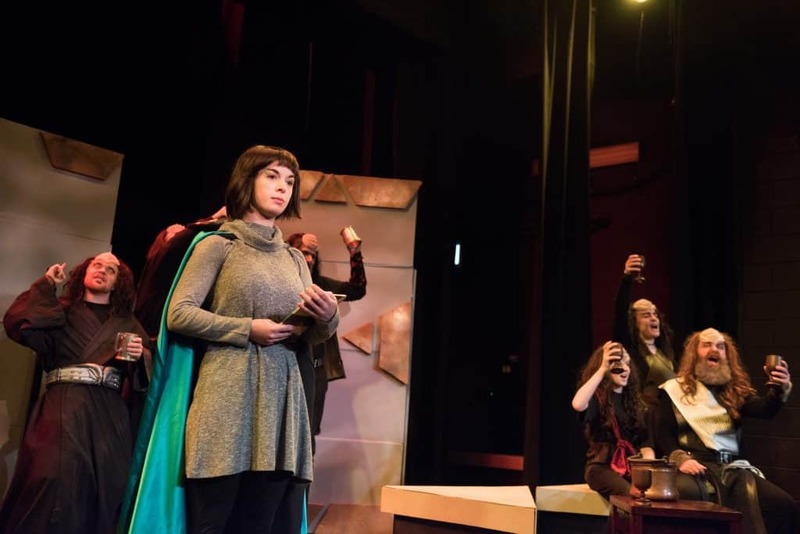 Even more impressive is the cast itself, a wonderful group of performers who spend the entire play speaking their lines in Klingon, a language that is both rough and guttural, not unlike German. Those new experiences included learning a script that would be spoken in a fictional language, getting to learn stage combat with Klingon weaponry, as well as mannerisms in addition to taking each role and making it their own. Part of this introduction to the Klingon culture included spending two weeks learning the dialogue with the help of an instructor from the Klingon Language Institute, in addition to fight training. All together, the cast did a phenomenal job, every single one of them. Anybody who either loves ‘Star Trek’ or ‘A Christmas Carol’ will get so much out of this play, especially because audiences will see first hand how much effort and work these players put into not only learning the dialect, but in bringing the characters to life, even on a whole different world. As the Christmas season is well under way, many great Christmas traditions, particularly when it comes to media and culture, are in full swing. While this may be a different sort of Christmas play to take in during the holiday season, it is also immensely enjoyable and fun to watch. 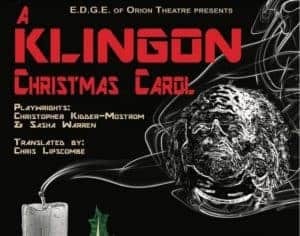 To all who are fans of theater, Star Trek or Charles Dickens, please make a point to see ‘A Klingon Christmas Carol this year’. It is a treat that one should not miss out on. 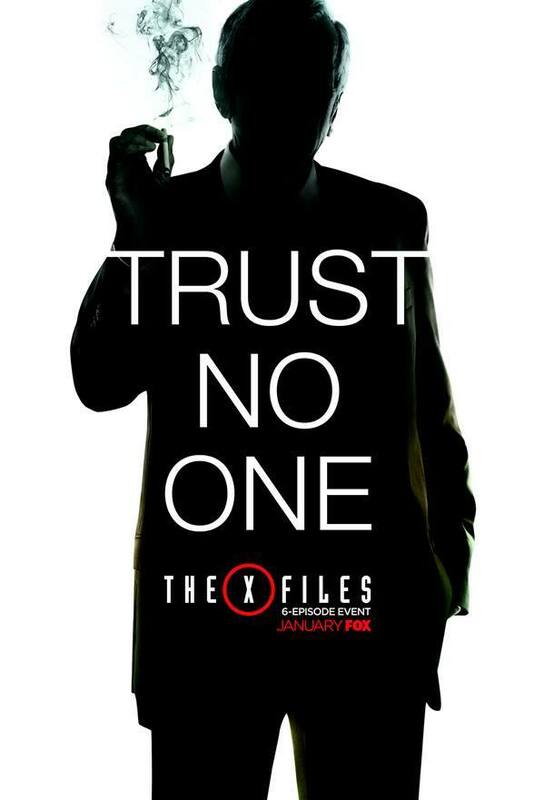 SEE BELOW FOR BONUS SHOW MIRTH! To take advantage of all the Kaos, buy your tickets early and get your Klingon Kringle on! 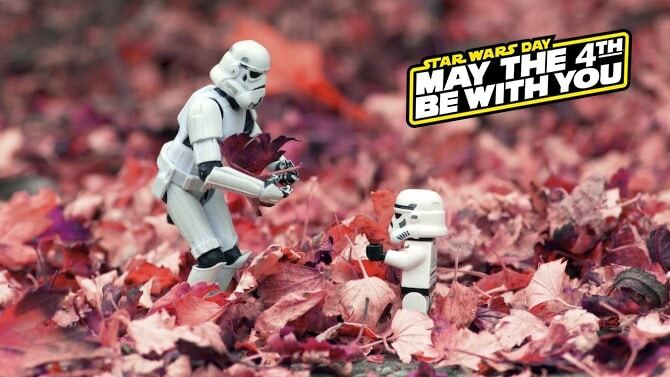 April 29, 2015 April Carvelli Comic Books, Cosplay, Fan-Made, Movies / TV, Right in the Feels, Spotlight Comments Off on C2E2 2015: Most Adorable Kids in Cosplay!